This Easter & Spring Middle School Math Activities NO PREP packet that will keep your sixth, seventh, and eighth graders engaged! This packet is just plain fun. Not only is it PACKED with grade level common core math problems, it also gives students fun coloring, puzzles, and problem solving. Use this packet for bellwork, classwork, extra credit, fast finishers, or homework. I hope these activities are a great addition to your Math classroom too! I am always amazed at how much fun students can have when you incorporate some holiday fun into your classroom. 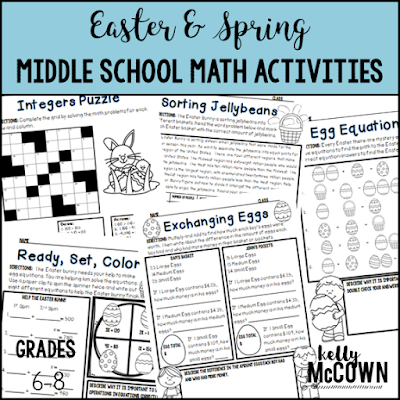 This April, create time for your students to have fun with an April themed Math activity and build rapport with your students.